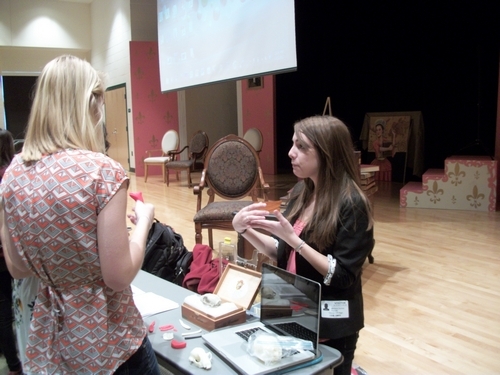 Mariana Zechini discusses a plastic replica of an artifact with a Clover Hill High School student. The student is holding a smoking pipe bowl in the shape of a canine’s head. On Friday, February 15, 2013, team members from the Virtual Curation Laboratory at Virginia Commonwealth University (VCU) travelled to Clover Hill High School in Midlothian, Virginia, to demonstrate some results from our virtual curation efforts to students from two history classes: Honors US History and Historical Research and Technology, taught by Emmett Hickam and James Triesler, respectively. Following my lecture outlining the basics of virtual curation, the three VCU students who are working in the Virtual Curation Laboratory each set up an interactive station and invited Clover Hill High School students to see the results of their individual research projects. Crystal Castelberry had a computer set up with digital models of colonoware vessels from George Washington’s Ferry Farm and also Mount Vernon—her research is focused on how 3D technology can facilitate the study of African American archaeology and heritage. Ashley McCuistion examined Ferry Farm through the ages, and had not only digital models of artifacts, but also plastic replicas, including an Adena point, a wig curler, a Masonic smoking pipe, and the nosecap of an Enfield rifle. She is interested in how virtual archaeology can be used in educational settings. Finally, Mariana Zechini focused on animals in archaeology, both from a zooarchaeological perspective (using a raccoon skull—real and replica) and as representations (a smoking pipe bowl in the shape of a canine’s head from a Susquehannock site in Pennsylvania). 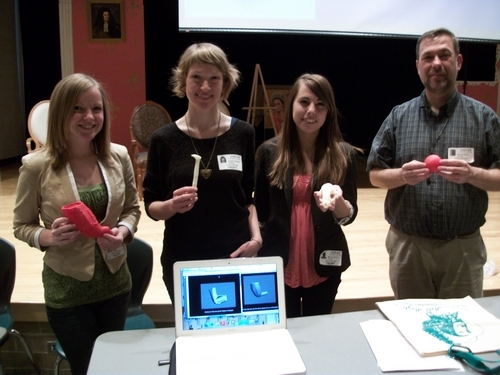 Virtual Curation Laboratory team members hold plastic replicas of artifacts created from scanned digital models. From left to right are Ashley McCuistion with an enlarged Masonic pipe bowl, Crystal Castleberry with a railroad spike, Mariana Zechini with a raccoon skull, and Dr. Bernard K. Means with some solid shot. Our basic goal for the three demonstrations was to see whether students were as comfortable with digital models of artifacts as they were with more tangible items. My students and I have been researching virtual archaeology for some time—and I’ve also been discussing the topic with other archaeologists working with virtual worlds—and there is some speculation that younger individuals should be more comfortable with digital media than those who are older and remember the days before cell phones. This follows from the notion that younger individuals have been immersed in digital media their entire lives—they are digital natives—while older individuals are more akin to digital travelers who have varying levels of expertise and comfort with moving through and around virtual worlds. The latter are thought to need guides more so than the former. 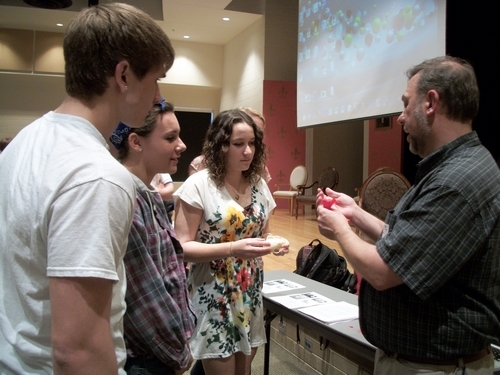 Dr. Bernard K. Means discusses digital models and plastic replicas with Clover Hill High School students. At least for the students at Clover Hill High School, however, we found a definite preference and interest in the plastic replicas of artifacts over digital models—although the students were very interested in the technology behind the creation of the digital and plastic replicas. We will continue to develop our educational and outreach efforts over the coming months—our visit to Clover Hill High School and our interaction with the bright and inquisitive students there will help us considerably with these efforts. And, we plan a return trip to scan artifacts in the school’s spectacular World War II museum maintained by James Triesler. He also has an online archival project (http://www.ittookawar.com/). Ashley McCuistion demonstrates digital models and plastic replicas from George Washington’s Ferry Farm to history teacher James Triesler. We’d like to extend our thanks to our hosts, Clover Hill High School history teachers Emmett Hickam and James Triesler, and their students.